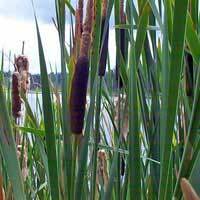 Cattail is quite common along lake shores and wetlands and often is only limited in its spread by water depth. It can outcompete other natives so plant it where you don't ming it spreading. The unique cigar like flowers provide interest, while the stand themselves provide nesting sites.